Our guiding educational philosophy can be easily summarized through the words of Nicholas Donofrio, retired IBM Executive Vice President of Innovation and Technology: In 2002 Donofrio was recognized by the Institution of Electrical Engineers -- the largest professional engineering society in Europe -- with the Mensforth International Gold Medal for outstanding contributions to the advancement of manufacturing engineering. He was named Industry Week magazine's Technology Leader of the Year. "The kind of people who will be best able to seize these opportunities are those I call "T-shaped" as opposed to "I-shaped." I-shaped people have great credentials, great educations, and deep knowledge-deep but narrow. The geniuses who win Nobel prizes are "I-shaped," as are most of the best engineers and scientists. But the revolutionaries who have driven most recent innovation and who will drive nearly all of it in the future are "T-shaped." That is, they have their specialties-areas of deep expertise-but on top of that they boast a solid breadth, an umbrella if you will, of wide-ranging knowledge and interests. It is the ability to work in an interdisciplinary fashion and to see how different ideas, sectors, people, and markets connect. Natural-born "T's are perhaps rare, but I believe people can be trained to be T-shaped. One problem is that our educational system is still intent on training more "I's. We need to change that." Students understand and are open-minded to the breadth of Organizational Science knowledge and perspectives. 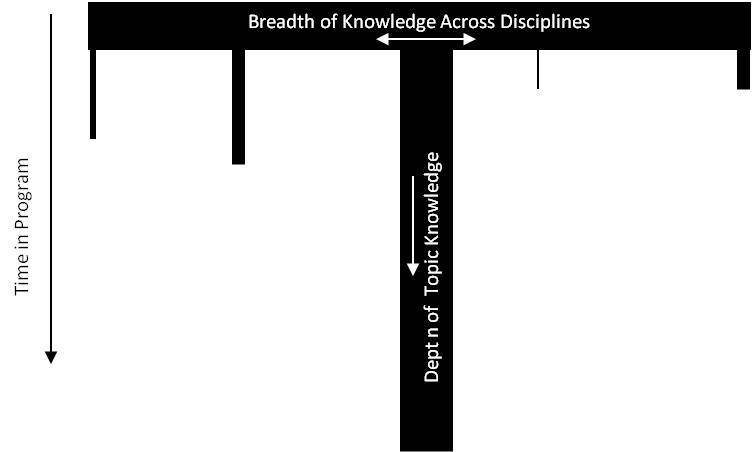 Students navigate easily across disciplines and perspectives, make interconnections, seek transdisciplinary science and practice synergies where relevant, and can view micro, meso, and macro OS topics through many disciplinary lens simultaneously. Students are not “jacks of all trades and disciplines”. Depth across a key content area (or two) is essential to success. Depth and breadth within and across OS is a life-long pursuit. Doctoral training is just the beginning of this journey.